Read this sensational mystery bestseller before you watch the 13-part Netflix series, executive produced by Selena Gomez. This special edition is complete with exclusive behind-the-scenes content including a 16-page full-colour photo insert featuring scenes from the show, and interviews with the cast and crew. You can't stop the future. You can't rewind the past. The only way to learn the secret ...is to press play. Clay Jensen returns home from school one day to find a mysterious box with his name on it, outside his front door. 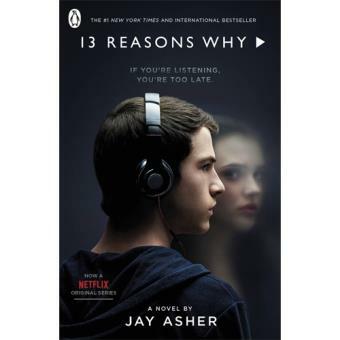 Inside he discovers a series of cassette tapes recorded by Hannah Baker - his classmate and crush. Only, she committed suicide two weeks earlier. On the first tape, Hannah explains that there are 13 reasons why she did what she did - and Clay is one of them. If he listens, Clay will find out how he made the list - what he hears will change his life forever. Se já viste estes filmes ou séries, tens mesmo de ler os livros que lhes deram origem. Se ainda não viste, aproveita para leres primeiro o livro antes de os veres no ecrã.